Years ago, when God brought Wyatt out of his addiction to crack cocaine, he began passionately pursuing saving others from the darkness that once kept him bound. 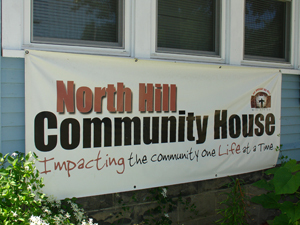 He shut down his crack houses and he and his wife Patricia turned one of them into a ministry home, the North Hill Community House, that is a light in the neighborhood today. They do this through a home-based food pantry run out of his garage. “It’s what you call a mom and pops,” he said. 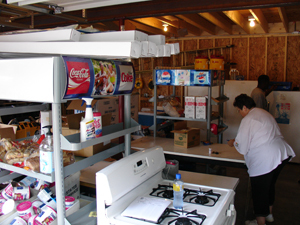 His garage is filled with refrigerated items, medication, tissues and other hygienic supplies that they give out on the last Thursday of each month to people in the community. They also have a storage unit upstairs filled with furniture and household items for those in need. They offer tutoring, community meetings, a back to school outreach and offer children a safe place to come after school. 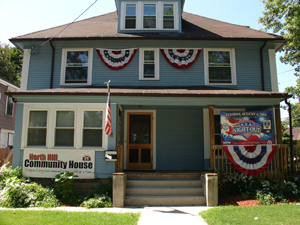 “This house used to be a drug house but now it is a safe haven for kids,” Wyatt said. 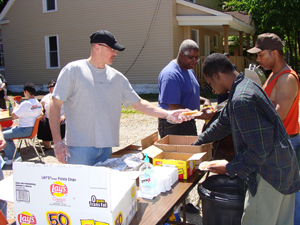 They provide food to about 100 people or 25-35 families a month. If it weren’t for where he had been Wyatt wouldn’t be doing what he is doing now. It was because of his drug addiction and falling so far away from God that he found his calling in life. It all began in 1989 after he got out of the military. “I started hanging with my old friends, got out on the streets and began to run with a few friends that were into the drug games,” Wyatt said. The money was good at the white collar level and so he established several dope houses. He says that he couldn’t figure out what crack actually did to people. He was somewhat intrigued by the power it had over them. He wondered ‘How could a drug make a woman steal and stay out all night and prostitute?’ That curiosity led him down an even darker path. “It just consumed me,” he recalled. Finally one day there came a crossroads in his life. “I went on a three day drug spree and made up in my mind that that was it. I got half an ounce of cocaine, cut it up and was basically going to kill myself,” he said. After his drug binge he says he was drunk out of his mind but somehow got home Sunday morning. His wife found him in his car, cleaned him up and took him to the nearest church where they sang ‘This Little Light of Mine’ as he walked in. “I just jumped up out of nowhere and started running because I was so bound up. I was at the end of my rope. I didn’t know what to do, all I knew is I had to run to Jesus,” he said. He ran to the altar and asked God to forgive him and he says he knew he was delivered that moment. “The Bible says that we wrestle not against flesh and blood but against principalities. This thing (cocaine) that the devil has released on this earth is one of the most powerful drugs. A thousand hits are not enough,” he said. After cutting his crack habit, Wyatt had no withdrawals. He says that he was delivered of his drug addiction and other addictions instantly. He then referred to the woman in the Bible with the issue of blood. Now Wyatt is using what once trapped him to help transform the lives of others. 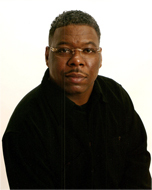 Along with the above mentioned outreaches he teaches financial literacy, credit repair, banking and how to managing a mortgage. The ministry collaborates with many people, including city officials. “We wouldn’t be able to make it if we didn’t collaborate,” he said.